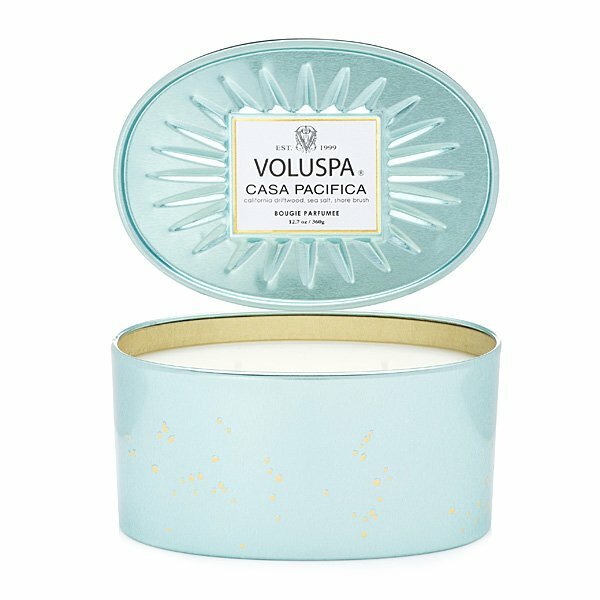 Voluspa Casa Pacifica Oval Tin Candle blends notes of California driftwood, sea salt and shore brush for an evocative fragrance that harmonizes a dreamy beach house with Pacific ocean ambiance. Voluspa Vermeil 12.7 oz. Oval Tin Candle has a 2-wick configuration complete with decorative snuff lid to help keep the creamy coconut wax dust-free when not in use. This elegant container gets a second life when used for flowers or trinkets when candle is gone. Made with no phthalates, parabens, sulfates and are not tested on animals. Voluspa's Vermeil Collection beckons images of gilded silver plate with pure gold, inspired by historic use in the finest jewelry of precious metals. Vermeil will delight the senses further, unveiling modern pastels on reflective mirrored surfaces with each product revealing a surprise luxe gold interior. The design focal point, the star embellishment, is translated on the packaging, while the custom Voluspa designed glass captures the antique pressed glass style of the 1920's. Casa Pacifica- Great Ocean Scent!